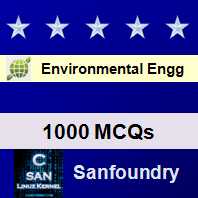 This set of Environmental Engineering Multiple Choice Questions & Answers (MCQs) focuses on “Construction of Imhoff Tank”. Answer the following question using the above figure. 1. Which of the following is represented by C? Explanation: C represents the digested chamber. It is placed in the lower section of Imhoff tank. 2. In which of the following, the settling of solids takes place? 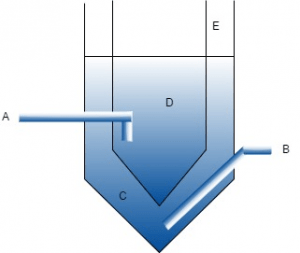 Explanation: The settling of solids takes place at sedimentation chamber. It is represented by D in the above figure. Explanation: The maximum flow through the period at D is 0.3m/min and its design depth should be between 3 to 3.5 m.
4. The sludge is digested in which of the following? Explanation: The sludge is digested in digestion chamber. Its minimum design capacity is 57 liters per person. Explanation: The gas chamber is represented by the E in the figure. It is located at the sides of the Imhoff tank. 6. The sewage comes in the Imhoff tank through which of the following? Explanation: A represents the inlet through which the sewage enters the Imhoff tank. Explanation: The detention period of the sedimentation chamber of an Imhoff tank is 2 hours. It is represented by D as shown in figure. Explanation: B represents the outlet of Imhoff tank. It carries the partially treated sewage. 9. Which of the following is called as scum chamber? Explanation: Gas chamber is also called as scum chamber. The minimum design width of the gas chamber is 60cm.